Roasted vegetables are a delicious side dish. You can mix up a wide variety of vegetables for roasting and use different herbs and spices to flavor them. Roasting intensifies the sweetness of the vegetables and caramelizes the outside. 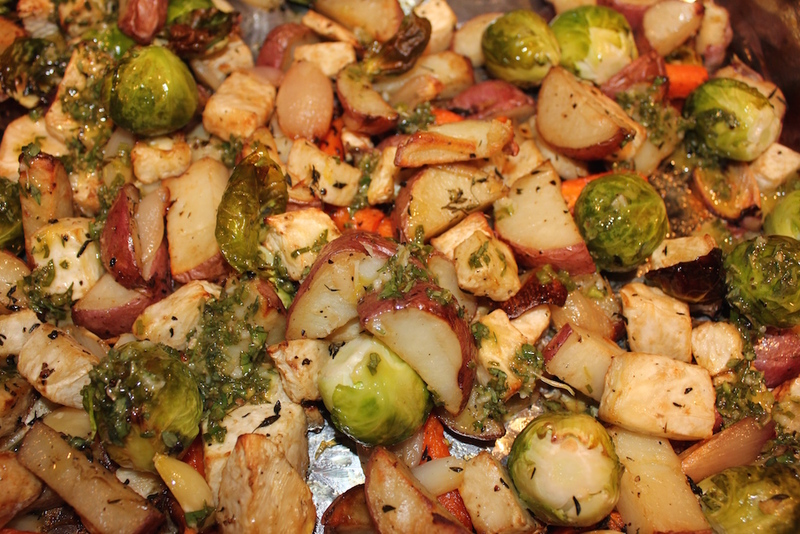 This recipe celery root, red potatoes with the skin on, sweet carrots, shallots, garlic and Brussels sprouts. Each provides a unique texture, flavor and color. Dress them with the vinaigrette right out of the oven so the vegetables soak up the flavors of the lemon and herbs. Leftovers? Make this recipe for Roasted Vegetable and Ham Frittata. Root vegetables take a good hour to cook at a relatively high temperature. Add vegetables, such as Brussels sprouts, later otherwise they’re overdone and mushy. The Brussels sprouts I purchased were quite large and took 15 minutes to cook. Adjust time for smaller ones. Roast for 45 minutes. Add the Brussels sprouts and roast for another 15 minutes. Remove the thyme stems and toss with the lemon-herb vinaigrette. Root vegetables take a good hour to cook at a relatively high temperature. 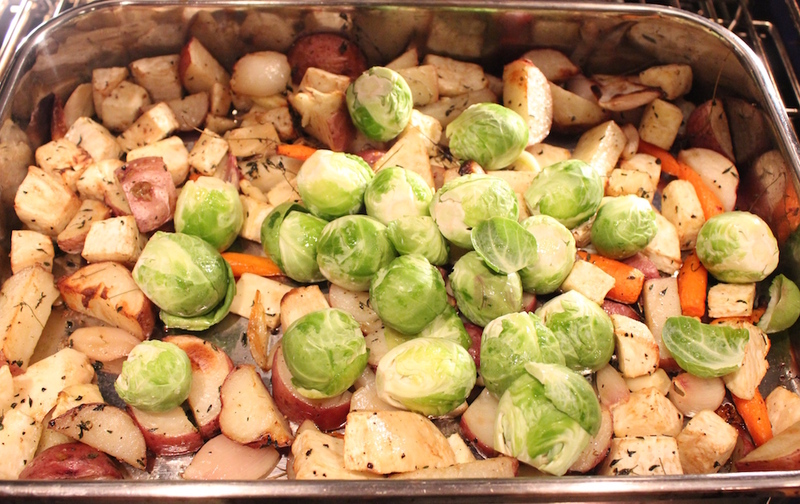 Add vegetables, such as Brussels sprouts, later otherwise they’re overdone and mushy. 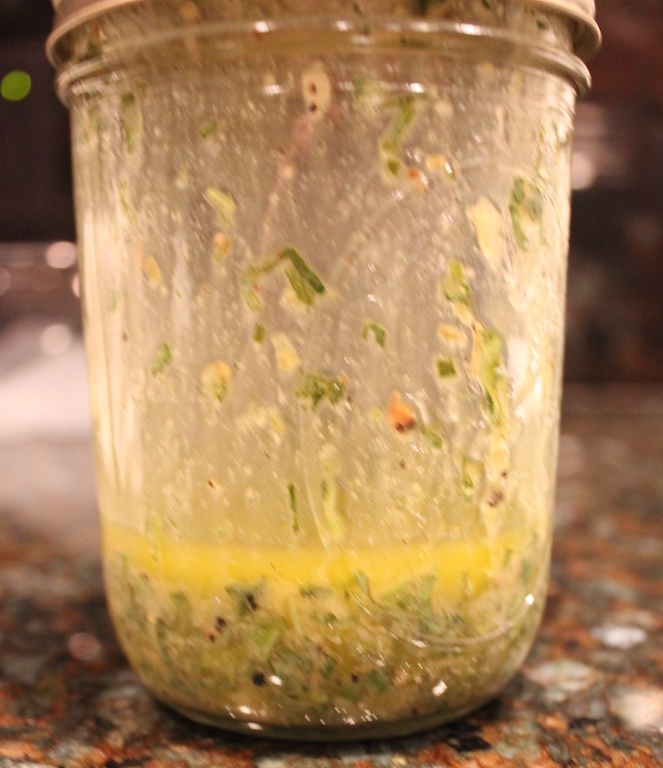 Combine the oil, lemon juice, vinegar, chives, thyme, parsley, garlic, salt and pepper in a covered jar and shake well. Clean, trim and cut the celery root into two-inch cubes. Cut the potatoes, skin on, into two-inch pieces. Cut the carrots on the bias into two-inch pieces. Halve the shallots and garlic. 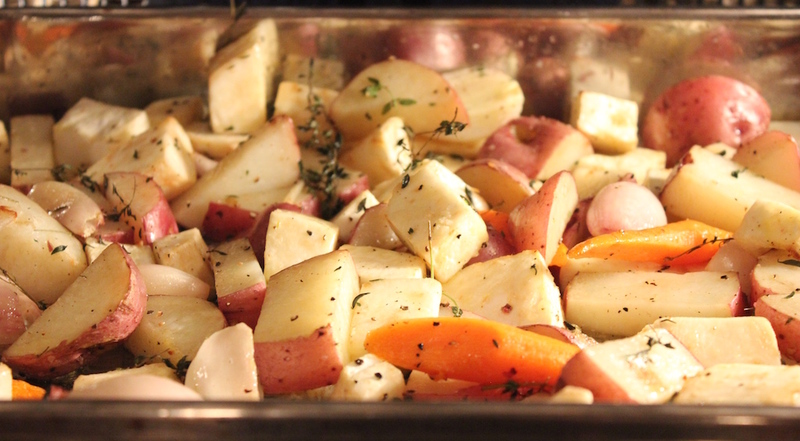 Toss together in a large roasting pan with the oil, thyme, salt and pepper. That looks absolutely descrumptious! I just finished dinner 20 minutes ago and this made me hungry again. Oh yumm. . . this looks absolutely delish!! I think I could make a meal of this veggie dish!! Can’t wait to make it! Got my grocery list already!! Thanks!